This gift includes everything you need to create the perfect wine-tasting party for four. 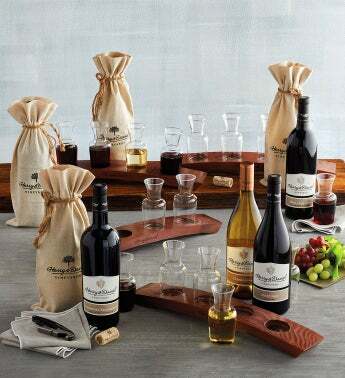 It includes four bottles of our own Southern Oregon-made wine—three red and one white—each in a linen wine bag. There is a wooden tray for each person, along with carafes to taste from. We've included a wine opener as well. All of the accoutrements are reusable for countless wine tasting parties to come.